The last day of school was Thursday for Cassia County students and some rode home in style. The school district recently received three new propane-run buses. Jim Hamilton, the transportation supervisor for the school district, said they bought two in 2017. “We liked them so we bought three more this year. We just got them in last week,” Hamilton said. Out of 63 buses the school district has, they have five that run on propane. 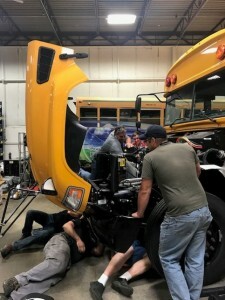 A school district here added six propane school buses to its fleet for the 2017-18 school year, replacing some diesel buses, and has seen about $12,000 in savings so far. Since the School District of Holmen put the Blue Bird Vision propane buses into operation, it has saved over $2,000 per bus in maintenance and fueling costs, said Beth Hobbs, the transportation supervisor for the district. In part two of Propane fleet, Roush CleanTech President Todd Mouw addresses his company’s recent deal with Schwan’s Home Services, one of its largest autogas contracts yet, and answers questions about the autogas market, including how it stacks up against the growing heavy-duty EV segment. Schwan’s Home Service began using propane fueled trucks over 40 years ago and recently announced plans to add 200 more autogas trucks upfitted by Roush CleanTech. And they’re not stopping there. The Minnesota-based company plans on leasing an additional 400 propane trucks by year’s end. With most of the alternative fuel headlines focusing on electric and hydrogen fuel cell vehicles, it’s worth remembering that autogas ranks as the third most popular fuel in the world. Jack Roush has been fielding NASCAR entries for the past 31 years, and during that time his teams have amassed a NASCAR record 325 victories, while covering over 1.78 million miles in NASCAR action and bringing home eight championships. Roush’s lifetime of achievement was rewarded Wednesday evening, when he was named a member of the 2019 class of the NASCAR Hall of Fame. We offer a variety of propane system training options throughout the year. In addition to our Factory Technician Workshops we hold at our headquarters, we offer On-Demand Training at a location near you and Web-based Training. 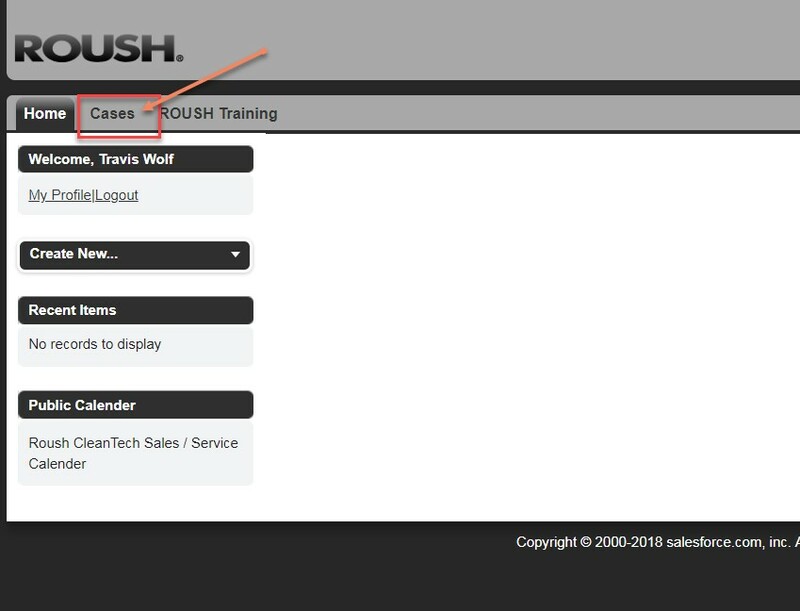 The type of On-Demand Training course depends on your needs and experience with ROUSH CleanTech vehicles; from a couple hour Vehicle Overview, to a full-day Advanced Diagnostics Training. The training location can be a Blue Bird or Ford dealership as well as a fleet location with classroom and shop space. Availability of a ROUSH CleanTech vehicle will allow for hands-on content. Vehicle Overview training is targeted toward folks who are new to the ROUSH CleanTech system. It’s instructed by one of our trainers or field service engineers during our regular travels. The overview takes about one to two hours and gives you an understanding of the vehicle fuel system and maintenance. Standard Onsite training is for service centers or fleets that perform their own repairs. It’s led primarily by one of our trainers and / or a field service engineer. Scheduled in advance, these sessions take about a half a day and go more in-depth into vehicle service and troubleshooting. Advanced Training is geared toward facilities more experienced with working on ROUSH CleanTech vehicles and have completed other training. There is a limited class size to allow for more hands-on time. This training is instructed by both trainers and field service engineers. They last about four to eight hours and cover more advanced diagnostics and service procedures. You can register for these training courses at ROUSHCleanTech.com/training. Then click on the registration link for factory workshop, onsite training or web-based training. If you have any questions about our training options, please contact Lance Suttle at Lance.Suttle@roush.com. Propane autogas vehicles do promise less maintenance requirements than diesel. But, that doesn’t mean that there are no maintenance requirements. We’ve put together the top three preventive maintenance guidelines you should be following. These will help keep your propane vehicles running smoothly. Propane autogas fuel systems require much less maintenance than diesel fuel systems and are more comparable to gasoline fuel systems. It’s recommended that operators follow the same maintenance intervals and fluid specifications as called out by the OEM for the gasoline engine when operating a ROUSH CleanTech propane autogas fuel system. The only additional maintenance items for our propane autogas fuel systems are fuel filters. One filter is added into the filling line on all generations of our fuel systems. Another one is the supply line filter between the fuel tank and engine on a Generation 4 style fuel system. Both fuel filters are serviceable without draining the propane from the fuel tank. There are not any maintenance items within the fuel tank requiring it to be drained for any type of maintenance. These filters are both recommended to be changed out every 50,000 miles. If the operator notices a decreased filling rate on a unit as compared to others in the fleet, it could be a sign of a partially clogged filter and it should be replaced regardless of the vehicle’s mileage. Propane autogas fuel tanks should be inspected for signs of surface rust or corrosion on an annual basis. If corrosion or surface rust are found, the fuel tank should be refinished to inhibit any further surface rust or corrosion from forming. We’ve worked with our propane autogas tank suppliers to develop refinishing procedures. We also have a FAQ document which answers many common questions in regards to tank corrosion and tank inspection at https://www.roushcleantech.com/service-manuals/. ROUSH CleanTech propane autogas fuel systems work with standard OBD II diagnostic equipment and require very minimal tooling to work on. However, we created a list of relatively low-cost special tools that we recommend you have in your shop. That list can be found at https://www.roushcleantech.com/training/. We also have information on several types of propane transfer systems. These can be used to speed up the repair process when in-tank repairs are necessary and require the propane fuel to be drained from the tanks. There’s the ROUSH CleanTech Transfer System that uses in-tank fuel pumps plus two other manufacturers’ transfer systems we recommend. You can find out more at https://www.roushcleantech.com/training/. We’ve also developed our own diagnostic software application, known as the ROUSH RDT tool. This tool is available to download for free. It’s like other OEM forms of diagnostic software and requires the use of one of our recommended pass-through devices to communicate between the vehicle and the computer. To download the free ROUSH RDT tool, or for more information about the recommended pass-through devices, visit https://www.roushcleantech.com/rdt/. If you have any questions about preventive maintenance, please contact Mario Genovese at Mario.Genovese@roush.com. If we asked you how many warranty claims you currently had open, would you know the answer? It might surprise you. After a service center receives the parts they need from ROUSH CleanTech, we often have difficulty getting communication back from them to confirm the repair was successful. Of course we are eager to know that the customer has their vehicle back in operation, but we’d also like to pay you for your services. Repair completed date: the date the vehicle was returned to the customer. Requested amount: the total dollar amount the service center is seeking for labor and expenses. The final bill: a copy of your repair order or invoice showing the reimbursement amount approved by ROUSH CleanTech. Most service centers provide this information simply by responding to our support agent’s email with a copy of their repair order attached. If you’re logged in to our warranty website, you can finalize your case there as well. And, we recently introduced a new process that will prompt you to close your case through a brief survey if several days have passed without an update on the repair. We would like to see all warranty cases resolved and paid in a timely manner. Ultimately, it is the service center’s responsibility to provide us with the information we need to close your case. 1.Visit www.roushcleantech.com/warranty to log into your account, or to register for an account if you don’t have one yet. 2. After logging in, click on the Cases tab at the top of your home screen. 3. 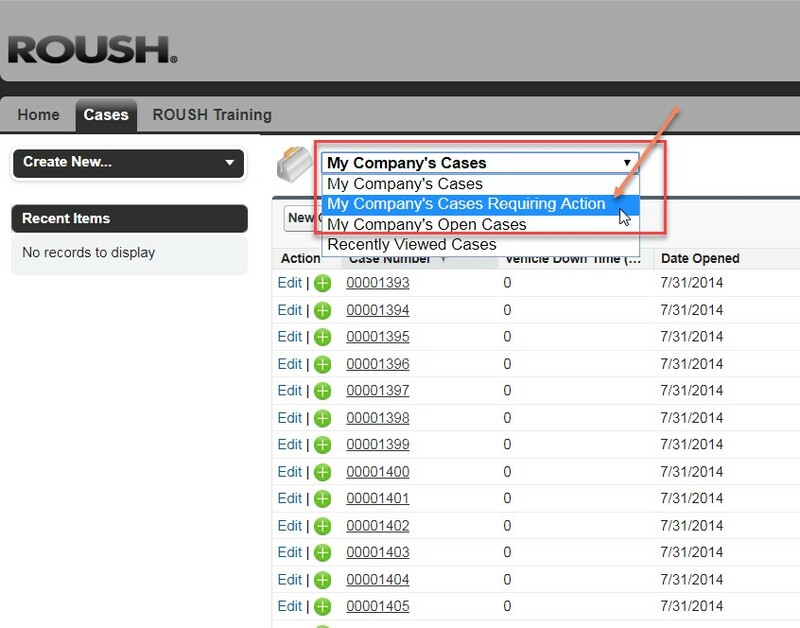 Use the drop-down menu to select My Company’s Cases Requiring Action. 4. Click on the Status column to sort your open cases by current status. Input Needed means that a ROUSH CleanTech support agent is waiting on you to respond to a question or provide diagnostic input so that we can ship a replacement part. Resolution Provided means that we have shipped a replacement part and are waiting for you to confirm if the repair was successful. Repair Completed means you have confirmed the repair was successful, but have not yet submitted a repair order or invoice for warranty approval. If you have any questions about closing an open case, please contact Travis Wolf at Travis.Wolf@roush.com. Are Alternative Fuels Really Going to Save Me Money? In this 30-minute webinar, Todd Mouw presents on the benefits of switching to propane-powered vehicles. He will also discuss emission concerns, upcoming regulatory change, the VW Settlement and how all of these factors tie into what’s driving operators to convert their fleets to propane. Every month we get closer and closer! Almost half of the state beneficiaries have drafted their Environmental Mitigation Trust plans. About half are still developing them. We are getting down to the finish line for making the case for propane school bus funding. If you haven’t reached out to your representative, now is the time. Each state has been assigned a beneficiary, usually an environmental or energy government entity. A state listing can be found on the VW Settlement Clearinghouse website. If your state falls into either of the last two categories, please contact Chelsea Jenkins at Chelsea.Jenkins@roush.com to discuss how best to approach your state agencies. We don’t want to miss this opportunity to get more funding for propane school buses!